John Scalzi has become one of those authors whose work I really enjoy because, in part, I never know quite what I will get prior to giving it a read. You can usually depend on a strong sense of story and well-crafted, definable characters but beyond that – what type of story – it’s hard to say. I remember being completely caught off guard by Lock In – the story of an FBI agent with Hayden’s Syndrome. Hayden’s Syndrome, caused by a virus, is a paralysis of the body that leaves the mind fully functional. (You can read Scalzi’s short narrative of the Syndrome for free on Tor’s account here: https://www.tor.com/2014/05/13/unlocked-an-oral-history-of-hadens-syndrome-john-scalzi/). Mechanical bodies (called Threeps) can be provided for a ‘Hayden’ (if you can afford it) providing the individual to lead a relatively full, normal life – except that they are living in a machine and often looked down upon by society. In Head On, we follow the further exploits of FBI agent Chris Shane and partner Leslie Vann. Chris is a Hayden and has been for a very long time. In fact Chris is a bit of a celebrity, having been a poster child for Hayden’s when very young. At the start of the book, Chris is attending a sporting event – Hilketa, a violent sport for Hayden’s/Threep in which Threep bodies are literally torn apart and heads lopped off (the Hayden can vacate the body at any time). Chris’s parent invited Chris, even though Chris has no interest in the sport. Chris’s father, a one-time NBA star, is being courted to invest money into a European league for the Hayden sport. But something doesn’t go too well. Chris gets a text from a roommate and is told to check the field. One of the players has died. Not the mechanical Threep body, but the actual, human controlling the body. The human body that is in actuality hundreds of miles away. And so begins a wild mystery, with twists at every turn. And if Chris isn’t extra careful, the Threep body (bodies), despite the heavy-duty nature, may not keep Chris alive. Scalzi delivers a fast-paced mystery in a well-defined future world … so well-defined that it feels a little too real sometimes. He’s toyed with his reading audience a bit and made Chris gender neutral – a fact that came to light for me when I reviewed the audio book of Lock In – the book that was narrated by Amber Benson and I assumed the character was female, but other reviewers were referring to Chris as ‘he.’ Ah…we still don’t have any more clues to Chris’s gender, which is a mystery the author leaves for the reader. I felt that this book was significantly different from Lock In. The previous book felt more like a social science fiction story whereas this is definitely more of a mystery. And I liked it. I liked it a lot. You probably will, too. Looking for a good book? 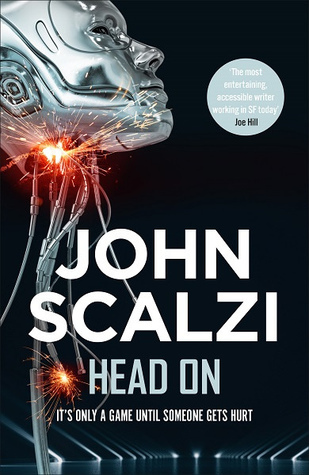 Head On by John Scalzi is the follow-up to Lock In. You’ll want to read them both, so go ahead and take care of that now.